Guy files trademarks matching names of celebrities, major brands and their domain names. A couple weeks ago I wrote about Trademark King, Inc. The Indiana company had filed a trademark on Trademarking.com, a domain name owned by domain investor Rick Schwartz. When I reached out to Douglas Lehocky, the person listed on the trademark applications, he told me it didn’t matter if someone else owned the domain name Trademarking.com. If he got the trademark first, he had rights to the domain names. He would have his lawyer have the domain taken down. He also told me he buys and sells trademarks, so he knows what he’s talking about. Pretty stupid, but it was just one misguided trademark application. Until now. All of those car company .com trademark applications? Yep, Trademark King is behind them. And he’s not just going after car company domain names and names. He also filed trademarks on famous names like Elton John, Pete Rose and Muhammad Ali, as well as corresponding domain names. Not content to just go after billion dollar car companies and celebrities, Trademark King also filed trademark applications related to the NCAA Final Four, Google.com, Target.com, YouTube.com, Twitter.com and Facebook.com. He’s also got the sports covered: NFL.com, NBA.com, NHL.com. You can see a full list of Trademark King Inc applications here. IC 035. US 100 101 102. G & S: Brand development and evaluation services in the field of trademarks, trade names, and domain names. ; Creating trademarks for others. They have first use dates of late November. Rick Schwartz might wait around before going after the Trademark King, but these big companies aren’t going to just wait-and-see. And if Trademark King thinks he’s going to get paid off, he’s sorely mistaken. That idiot wasted a lot of money. Well, at least the porsche.com will be costly for him. German TM lawyers are pesty. By applying for a TM “Porsche” (.com is just a TLD and doesn’t count) he violated one of the most famous TM’s in the world. And he did so in one of their core business fields: MARKETING! He even testified that he used it in commerce! Worst idea ever! Since the filings are confusingly similar to existing trademarks, do they even stand a chance of winning approval? It’s are not “confusingly similar” – it’s are IDENTICAL to the most important marketing tool Porsche has at hands: Their Internet Domain! And he applied for it for MARKETING services! Totally qooqoo. Why doesn’t he apply for “POTUS” and demands the keys to 1600 Pennsylvania Ave NW? No, they won’t be approved. Sorry to say that on most he will likely fall foul of “Bad Faith” in Opposition proceedings and thus will only make lawyers rich, as usual. My only guess is he is trying to get free publicity for his company. There is no chance he will be granted any of the Trademarks he’s filed for, and even if he gets a few, the road to keeping them will be very rough, and expensive. Deep down, even with an uncontested Trademark for Yahoo.Com, Google.Com or 99% of the brand’s he’s filed for, he would not win a UDRP case. In fact, I would guarantee any attempt he would make to file a UDRP, or a civil case for that matter would result in a judgement “With Prejudice”, which would make further fillings worthless. For what it’s worth, I’m sure he’ll get the free publicity he wants. He would’ve got the same publicity for just filing one or two of the big names like Google.Com or Yahoo.Com… It makes you wonder why he spent all that time and money filing the rest. Why can’t he just run naked onto a football field with his company name painted on his chest and back like any respectable nut? Yeah, I’m going to say he could have bought more publicity for $25k. I’m not sure of the number of Trademarks, but the price for any oneTrademark application is pretty small, if you file it yourself. Another motive could be hoping to accidentally catch at least one or two big fish who somehow screw up. I calculate about $50,000 in filing fees. As this bizarre story continues to unravel, I am running out of popcorn to see the final result. I want to see how hard Trademark King, Inc. is slammed so there is a clear example set that there’s no way around getting out of TM issues. The only lawyer I could think of who could defend him of getting out of major penalties and quite possibly winning domain names, Johnnie Cochran, passed away nearly a decade ago. And even then, he would charge a hefty sum. Wow, he must be mentally afflicted. If there is an “idiot of the year” award I know who should win it. Mentally afflicted or not, the guy just dropped over $25K in fees, and doesn’t seem to have successfully uploaded any specimens of use for his intriguing service of “Creating trademarks for others”. But, hey, maybe he’ll come up with a “certified email delivery service”. I just learned that “Enrico” is Italian for “to enrich”! I agree with Jay, this guy just blew away the competition for “Loon of the Year”. Anyone else with a painfully wrong idea of how trademarks work, and a pile of cash to burn, is going to have to try hard and hurry to top this astounding piece of idiot performance art. Filing these turkeys on Thanksgiving is simply magnificent. Andrew, I hope you can drag him in here to the comments to take a bow and to explain how we all just don’t appreciate his genius. Having Mr Berryhill agree with me was the highlight of today. Although I must correct that I did NOT name the person WHO should win “idiot of the year” award, I just said I know who should win it. This guy is a PR boon to the domain industry. Anytime a domainer is called a cybersquatter by the holder of some belated TM, we can all just point to this poor fool squatting on trademarks. Which one of you domain investors put the Trademark King up to this stunt? Surely nobody can be naïve enough to think he can shake down all these massive companies at the same time! There are so many crazy people out there it is unbelievable. A) I had an idea last week and want to buy your domain for 20 dollars because you are not using it properly. B) I had an idea last week…+ I will register a trademark for my idea unless you sell the domain to me for 20 dollars and sue you after that and get the domain for free so you better sell it to me for 20 dollars you squatter. D) I have a registered trademark for “common keyword term” but upon closer inspection it shows they just applied. E) I have a registered trademark for “common keyword term” but upon closer inspection it shows the application for trademark has been dead 2 years. F) I have a registered trademark for “common keyword term” but upon closer inspection it shows the trademark is for “C. K. Term” and they demand “common keyword term.com” based on this. Domain investors are the most villified and maligned group of entrepreneurs at the moment and every reporter who uses the squatter word and spews digital hatred against domain investors is feeding these delusions and is basically calling domain investors almost the equivalent of the N-word by using the word squatter. Sometimes I wonder whether not replying to any emails would be the wisest option. I’ve had most of those happen to me. The most recent one applied for a Trademark last year of a generic keyword term that matches a .com domain I’ve owned for more than 10 years, that they own as .Net. They offered a small price. I refused, They called me a domain hoarder. A few months later they sent me a link showing they just received their Trademark. Rather than fight a URDP, I requested the Trademark be cancelled, among other things, on the grounds that the very existence of my domain proves they were not the first to use the term. They claimed that since I didn’t develop it, I never earned revenue from it, therefore my registration date doesn’t count as “First Use in Commerce” . What they failed to realize is that showing “First Use in Commerce” may be a requirement to get a Trademark, but it has nothing to do with my right to continue to use that term, and own the domain. In fact, it can be easily argued that paying the annual fee and putting Ads on the site is commerce. Money did change hands, and I the web site is advertising the brand. That’s a really good list, Jay. I’ve seen each of those this week, and it’s Tuesday. To me it seems people are getting more blatant in their outrageous behavior and this is cheered on by the media with their 90% inaccurate use of the word squatter. They should make articles every month about those evil parking space squatters too who keep perfectly good land as parking spaces and charge money for it when that land could be turned into a shopping mall or a hotel resort. @Jay I got about 3 requests for transfer of a domain TO GoDaddy other day and when I contacted the guy making the requests and asking why he said “Well I thought you were’nt using the domain” . And that wwas a supposedly legit company . Doh !. I get those kind of crazies all the time too. They should be told that what they are trying to do by trying to transfer a domain they do not own is stealing so they are trying to commit theft by sending bogus transfer requests. Once somebody tried to transfer my domain a couple times and then I started getting threats from some IT guy that I was breaking the law by having control of their domain and I should return it to them. When I patiently explained that I have owned it for 2 years and it was freely registerable when I registered it and asked for more info from him he came back a day later and apologized because one of the VP’s at the company thought they owned that domain “common term” when instead they owned a three part version “common keyword term” but just internally referred to it as “common term”. The IT guy said he will try to manage the domains from now on instead of the VP. Good point. He is as well informed as some actual UDRP complainants’ lawyers. I agree with every comment here, but why has no one in the domain industry has ever questioned the domain company using the name Igloo? I am sure that when anyone hears about a company named Igloo thinks about the real company named Igloo. Why would a start up domain company choose the name Igloo for their company, a name that is well known worldwide? I think of a dwelling made of ice, typically found among indigenous people of the Arctic region. When you think of “Delta” do you think of an airline, a plumbing fixture manufacturer, the mouth of a river, or a letter of the Greek alphabet often used as a mathematical symbol for change in magnitude? Dictionary words are often used by several different parties as marks for different things. When I hear or think of Apple, I think of the fruit, without a doubt a generic word, but I would not start a company and name it Apple for obious reasons, and the company Igloo was world famous way way before Apple Inc came to exist. Which of these is the world famous brand that everybody should know? You do know that Jobs named it “Apple” because of a nostalgic fondness for Apple Records (the Beatles label, and arguably famous to many of that time). This wasn’t problematic until the computer company became one of the largest retailers of recorded music, and required the parties to come to an agreement. But, I’m with Jay here, I had to do a search and figure maybe you are talking about the people who make portable picnic coolers. 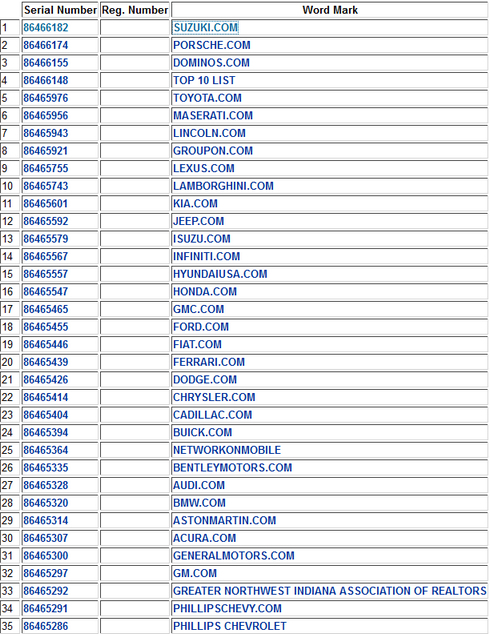 There are some 44 pending and issued US trademark registrations. I haven’t checked them all but, they are owned by a raft of folks for various things…. Many of the other ones are owned by the portable cooler people, who seem to have notably expanded their product lines in the last few years to include backpacks, tents and things like that, but it can hardly be said that “IGLOO” is per se “famous” given the various concurrent users for things unrelated to their general outdoor refreshment and related accessories. Interestingly, many of the other trademark claimants’ goods and services relate to a suggestive association of the word “igloo” with temperature regulation generally. Compared to that, domain consulting services is right off of the map. In other words, between portable coolers and domain services, there are other trademark claimants whose products are more closely related to the broad concept of thermal insulation or control in some way (coats, auto intercoolers, ceramic insulators). This is, of course, not meant as a legal analysis or advice, but is ample evidence that I need a keyboard break. First off, I do believe that the USPTO is required to accept the statements in a trademark application as true, at least to a certain level of the trademark application process. Second, I know for a fact that the USPTO (at least as of about this time last year) did not have a full “appreciation” of the extent to which people were filing intent to use trademark applications as a means of “harrassing” people who own domain names and trademark owners. I pointed the USPTO to 33 intent to use trademark applications filed by “an infamous cyberquatter” and the USPTO appeared to be of the view that since the cybersquatter failed to win any of his UDRP actions, no harm had been done. The particular cybersquatter I pointed out to the USPTO had attempted to use the existence of intent to use trademark applications to claim in UDRP actions that he had a right to a domain name or that he had legitimately registered a domain name similar to someone else’s domain name. Meaning that he let these applications die (failed to prosecute) when his UDRP actions failed and when he could not get “other satisfaction”. It seems that this was “a blind spot” in both the USPTO proceedures and in the UDRP process. Let the trademark application die, so there is no legal repercussions from the USPTO. And, my understanding is that there is no monetary penality for attempted reverse domain name hijacking in the UDRP process. I tried to impress on the USPTO the time and expense associated with defending UDRP actions, trademark claims using intent to use trademark applications and, the harm of someone registering a domain name similar to your business. I also tried to impress on the USPTO that a certain number of people probably don’t have the legal expertise to stand up to someone threatening them with UDRP actions and intent to use trademark applications. Note that when someone files an intent to use trademark application (even when they have not intent to prosecute the applicaton to a conclusion) that person can keep the application alive in application status using automatic extensions (bulit into the USPTO process) for about two years. That’s only if the application reaches allowance, and survives the opposition period. The time to respond to a refusal is six months. If an itu application is allowed, the applicant can file periodic extensions of time to show use. These applications won’t get that far. I wouldn’t count on that. The USPTO is required to accept the statements in the applications as true and the number of Letters of Opposition accepted by the USPTO are so few, Letters of Opposition may as well not even be permitted. A formal opposition proceeding involves time and expense which is part of some people game plan. What should be really elightening (and troubling) is when you read about a blantant attempt at reverse domain name hijacking and then you go to the USPTO’s website and see that the guy had no problems with the USPTO. There is even “an indication” from the USPTO that a charge in a Letter of Opposition that someone is using the trademark application process as part of a reverse domain name hyjacking scheme is not grounds for denying a trademark. I believe you missed my point. The thing you are talking about – keeping the application alive for several years – only happens if the application reaches allowance and before a notice of use issues. None of these applications are going to make it to allowance. Imho, he got what he wanted … free publicity … cliche: no such thing as bad publicity .. but also … double cliche … no such thing as a free lunch [ agreeing with a comment above, there are healthier$’ way for marketing ] …. and yet, if one looks up the entirety TM notice ( description ) of, say … the string “vip” dot anyNewGTLD … it is insane .. TM, Jurisdiction …. Combined with quasi-2k new gTLDs …..common denominator / enabling such: DNS ….. DNS will be the missing link, the bypass intersection soooon, isnt there a company out there claiming rights to all new .gtlds based on dns pre-new-tlds applicants ??? It doesn’t matter if you get a trademark on a domain name after someone already owns it. The domain name owner will never be found guilty of ‘bad faith’, which is 1 of the 3 required elements needed when deciding a UDRP complaint. I got a crash course on the subject when GM filed a complaint against me–and the verdict was in my favor. Give me ALMOST any name $450 and I will get you a TM within 3 months valid for 10 year ,and it is valid from date of filing. At least one of Trademark King’s applications was recently suspended. It’s been rejected (1) for likelihood of confusion (2) because the specimen is inadequate and (3) the Examiner suspects that Trademark King does not really own the mark. Trademark King, according the the Examining Attorney, has 150 pending applications for “Brand development and evaluation services in the field of trademarks, trade names, and domain names. ; Creating trademarks for others. Selling or leasing the domain name … to anyone in the world for a legal business activity.” That’s $48,750 in government fees alone. By the way, I’d do a trademark search (yourself, for free, on http://www.uspto.gov) and consult a knowledgeable practitioner before giving someone “ALMOST any name [and] $450” and hoping to get a registration issued. Trademark trolling can prove very costly.